Intronless genes, a characteristic feature of prokaryotes, constitute a significant portion of the eukaryotic genomes. Our analysis revealed the presence of 11,109 (19.9%) and 5,846 (21.7%) intronless genes in rice and Arabidopsis genomes, respectively, belonging to different cellular role and gene ontology categories. The distribution and conservation of rice and Arabidopsis intronless genes among different taxonomic groups have been analyzed. A total of 301 and 296 intronless genes from rice and Arabidopsis, respectively, are conserved among organisms representing the three major domains of life, i.e., archaea, bacteria, and eukaryotes. These evolutionarily conserved proteins are predicted to be involved in housekeeping cellular functions. Interestingly, among the 68% of rice and 77% of Arabidopsis intronless genes present only in eukaryotic genomes, approximately 51% and 57% genes have orthologs only in plants, and thus may represent the plant-specific genes. Furthermore, 831 and 144 intronless genes of rice and Arabidopsis, respectively, referred to as ORFans, do not exhibit homology to any of the genes in the database and may perform species-specific functions. 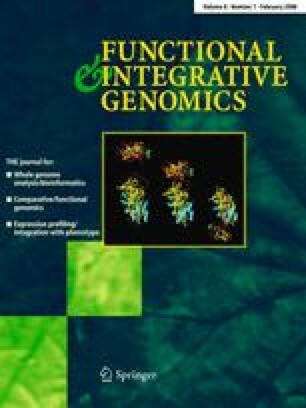 These data can serve as a resource for further comparative, evolutionary, and functional analysis of intronless genes in plants and other organisms. The online version of this article (doi: 10.1007/s10142-007-0052-9) contains supplementary material, which is available to authorized users. We are thankful to Rashmi Jain for technical assistance. This work was supported financially by the Department of Biotechnology, Government of India, and the University Grants Commission, New Delhi. MJ acknowledges the Council of Scientific and Industrial Research, New Delhi, for the award of Senior Research Fellowship.